Now that would have been an interesting story. I’ve added credit for the use of the photo, thanks. If in doubt throw it out! It is not worth the risk eating something you are not 100% certain about. The statement about finding them in summer and fall is misleading if read in other parts of the country. You could add “in the north/eastern USA” or give temps they grow, but this may be seen anywhere in the world for that matter. Please make a correction. Slide 7 talking about Amanitas. Changes made to slide 7 as requested for non PA readers. That Photo looks like a false morel? would that be correct? 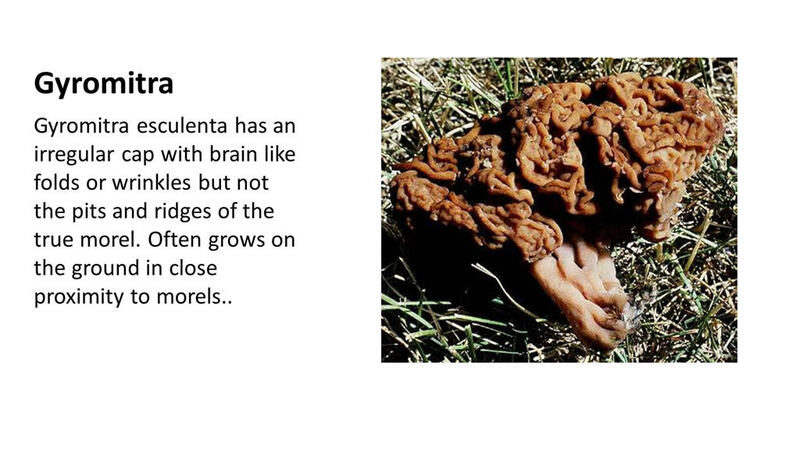 Yes the screenshot taken from the talk is of a Gyromitra esculenta or False Morel. Anybody have much experience with Trichalomos in our area? I have a lot of them. I believe they may be Tricholoma scalpturatum or Tricholoma argyraceum. I have been told that they are not poisonousand some are good but some will give you a belly ache. Would appreciate any help. I have lots of photos. Still haven’t a final ID. Thanks in advance for anybody jumping i here! I don’t know of any Tricholoma experts in our area. John Plischke III may be able to help, you can find his contact details on the Club Officers page. You can also share images in our yahoo page or probably better one of the facebook pages. We have a few Tricholomas on our life list but as far as I am aware Tricholoma scalpturatum or Tricholoma argyraceum are both European species and not found here in the US. Some Trichalomos are considered edible, some are listed as inedible. You would really need to know what you have before eating them. . . .